The corporate seal is stored in Blumberg's unique recessed compartment which enables the cover to close and fit into the matching black vinyl slipcase easily; provides increased capacity. The corporate binder has a permanent lock mechanism for security. The corporate name is etched in 24K gold on the spine. Order by noon and we ship the same day. Shipping is free. What's included in the Centennial corporate kit? 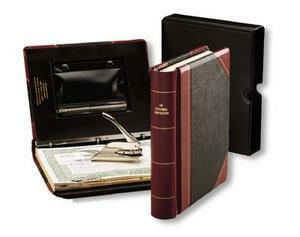 The Centennial corporate kit includes a corporate seal, certificates, transfer ledger, entity name etched in gold on the spine of the simulated leather rod binder, protective slipcase, index tabs, corporate record tickler, minute paper and optional minutes and bylaws for corporations or operating agreements for LLC's. Click here for detailed information about what's included in Blumberg corporate kits.